Ryan Kerrigan is at the office, staying late on a sunny day in June, and he’s having IT trouble. The film projector in Washington’s conference room isn’t working. We’re meeting in here because the position-group meeting rooms are being remodeled. It’s a perfect recipe for frustration to boil over, but Kerrigan is nonplussed—even when he eventually has to bow out and admit the broken projector has won. And so we huddle up and watch on a tablet. With its screen being about 1/30th the size of the projector wall, there is no longer any use for the laser pointer (the most fun part of watching film). Oh well. At least it’s still football. 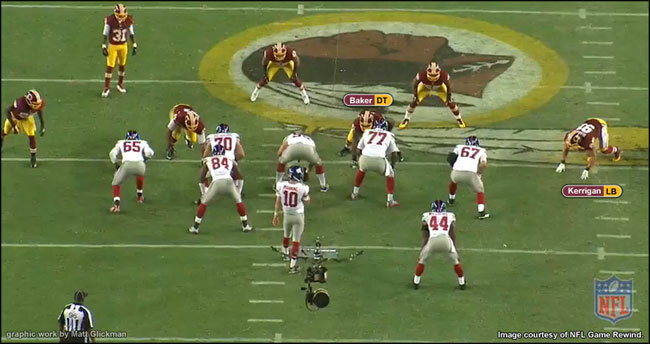 We’re viewing Washington’s two games against the Giants from last year. Kerrigan didn’t think highly of his performances in either one. In the tone of a man who’s joking but not completely, he wishes aloud that we could instead view his Week 2 game against Jacksonville, in which he had had four sacks. But I’ve picked this opponent because, barring injury, he’ll play the Giants at least six more times (including Thursday night) before he sees the Jags again. And it’s not like he was awful in these contests. He recorded a sack in each and, though credited with only five total tackles, he provided a meaningful presence against the run. Besides, I tell him, we both know sacks are overrated. A “great” season is 15 sacks. There are roughly 1,000 plays in a season. It has to be about more than sacks, right? Let’s be clear: Kerrigan is not an “all about the numbers” guy. He cares about production rather than statistics. There’s a big difference. He’s critical of himself in a fair, genuine way. Perhaps that’s why he’s improved steadily since being drafted 16th overall out of Purdue in 2011. “I had 13.5 sacks last year; I left a lot on the field with plays where I didn’t disengage from the blocker before I tried to tackle the quarterback,” he says. “So that results in a lot of missed plays—not only for me, it’s a missed opportunity [for our defense].” He says this at the end of our session. By then he’d made the point several times. So tell me about the running back’s alignment here. What goes through your mind? This is the first play Kerrigan and I are watching. It’s third-down-and-5, another good indicator of a pass. But I’m wondering about a potential chip-block. 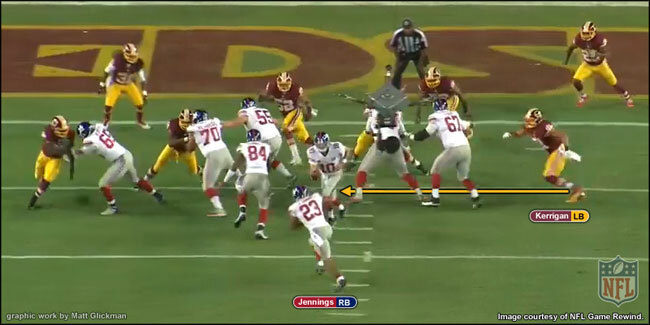 Running back Rashad Jennings is in perfect position to help right tackle Justin Pugh take on Kerrigan, if needed. Kerrigan adds, “Something our coaches would emphasize last year is to chip the chipper. Attack him, hit him so that next time he won’t want to chip you as much.” This time, Jennings didn’t chip. 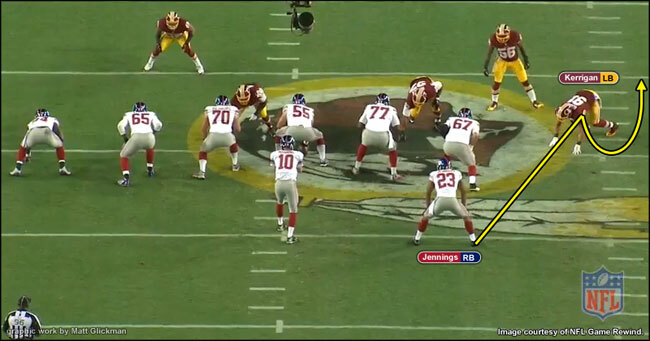 Throughout both games, Kerrigan repeatedly went one-on-one against Justin Pugh. The 2013 first-round right tackle has had a tough go of it these first two years and has since moved to left guard, where his body type is better suited. Presumably, that’s just fine with Kerrigan. Late in the first quarter of the Week 4 contest, just before a second down snap in the red zone, tight end Larry Donnell stepped back off the line of scrimmage and shifted down to an offset fullback position. Upon seeing Donnell’s initial movement, Kerrigan stood up and made a ‘Y’ symbol, as if performing the Village People’s hit song from 1978. 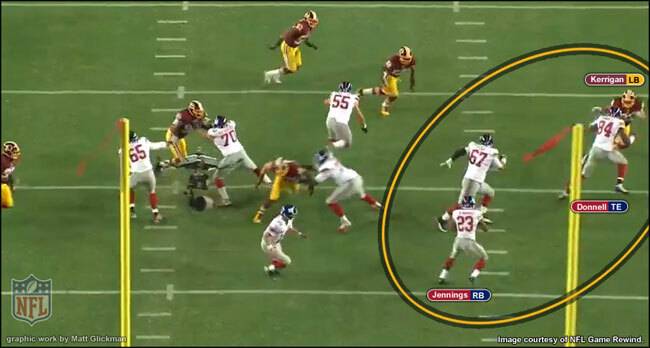 On this play, Kerrigan, unblocked by design, worked aggressively down the line of scrimmage to help stop a Rashad Jennings dive. Jennings is a pure downhill runner. 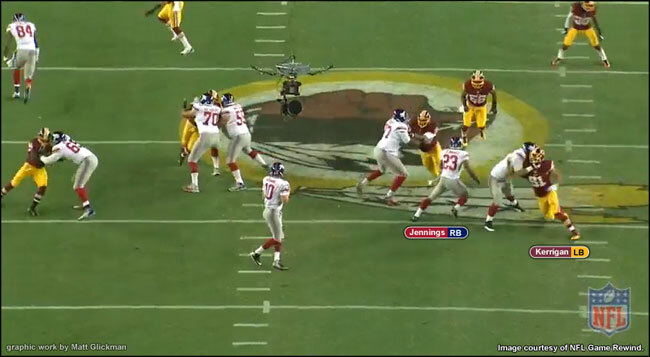 So would Kerrigan have attacked hard like this if the back were, say, LeSean McCoy? “See how my shoulders are completely turned towards the sideline,” he says. “Against a guy like McCoy, you need to have them more parallel to the line of scrimmage. Later we see Kerrigan sniff out a halfback toss on third-and-9. He had immediately widened outside to the point of attack, diagnosing the run on what’s typically a passing down. He’s not quite sure how he knew it was coming. 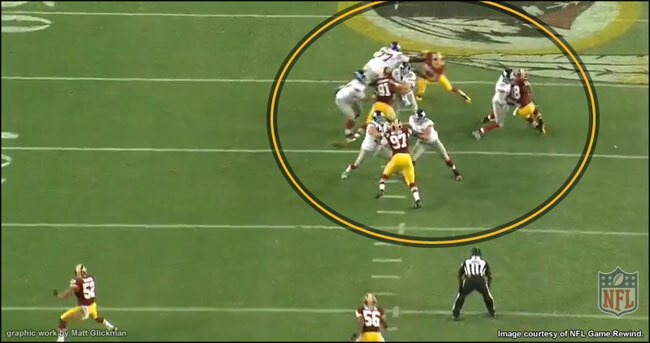 Jennings was forced back inside and tackled short of the first down. On the final play of the first quarter, Pugh got the better of Kerrigan’s pass rush. Talking to coaches and players over film study, I’m always amazed at how often the reason a play goes wrong is because somebody simply lined up incorrectly. 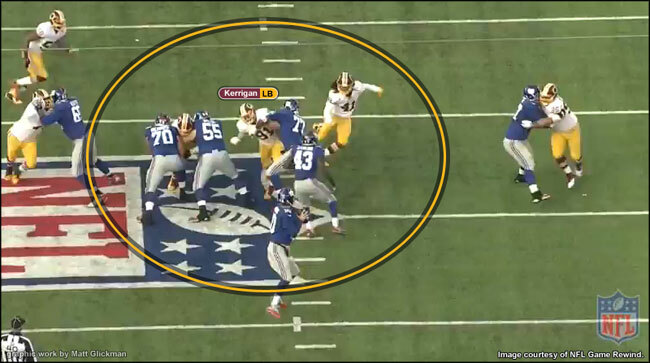 Once the play started, Pugh took a short angle set to block Kerrigan, fanning outside rather than dropping straight back. “That’s going to become something he’s pretty good at,” Kerrigan says. “He doesn’t deep-set much anymore because he’s got those good hands now; he wants to get his paws on you. The ball was out quickly several times; Eli Manning knows where to go with it. 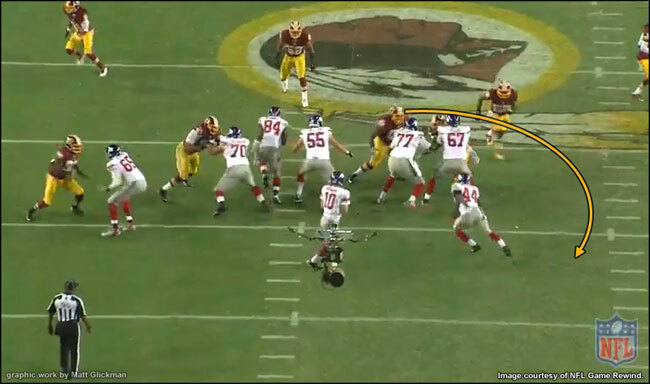 Kerrigan, by his own admission, doesn’t have a huge repertoire of pass rush moves, but the ones he executes are precise. If there were ever a time to stop reading and try running in place, this is it. The natural way of running is to fire your left arm forward along with your right leg, and vice versa. Pass rushers, however, train themselves to fire the same arm and same leg, because it allows them to maintain maximum distance between themselves and the blocker. Reach both arms in front of you for moment; now reach with just one. The reach of one arm is always longer, and preferred because defenders want to dictate the action. To give strength and stability to that one arm, a pass rusher should always attack by running with the same-side technique. We watch another nondescript bull rush against Pugh. Then Kerrigan expands. “One of the problems I had, not only in this game but throughout most of last year, was I would try to make a play on the quarterback or the ball carrier without discarding the blocker first. So I need to know, whether it's throwing him out of the way and coming back underneath, or just getting his hands off me in some other way, I need to discard him before I make an attempt at the ball.” He cites plays from the Arizona and St. Louis games where failure to discard a blocker cost him a sack. 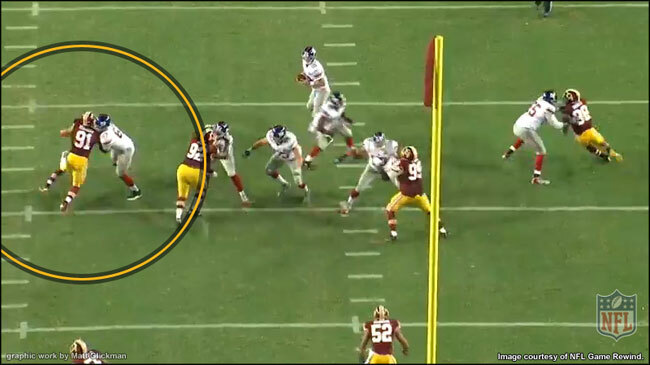 Kerrigan still forced Manning to move off his spot before throwing on this play. Any solace in that? 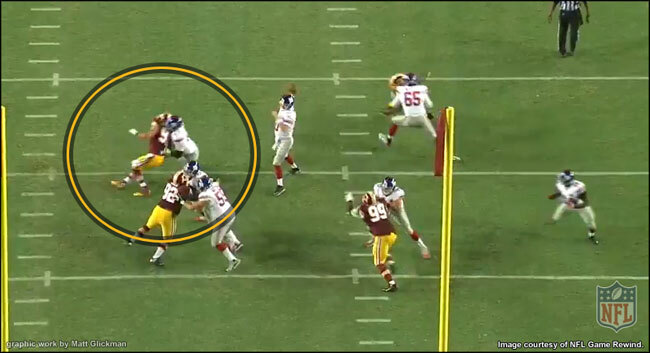 A few snaps later, we see Kerrigan execute what he calls a “rip and pry” move. It didn’t work, and so he improvised a spin move late in the down. Late in the first half Kerrigan gets his sack. It halted a drive and forced the Giants to play for a field goal. Any trash talking from you after this play? In the second half, I see what appears to be an E-T (end-tackle) stunt, with Kerrigan (the end) attacking inside to set up Chris Baker (the tackle) for a looping pass rush. It’s a bizarre defensive call; Baker has the body of a pregnant cow. He’s built to plug gaps, not loop and shoot them. Turns out, the play was spontaneous, not called from the sideline. 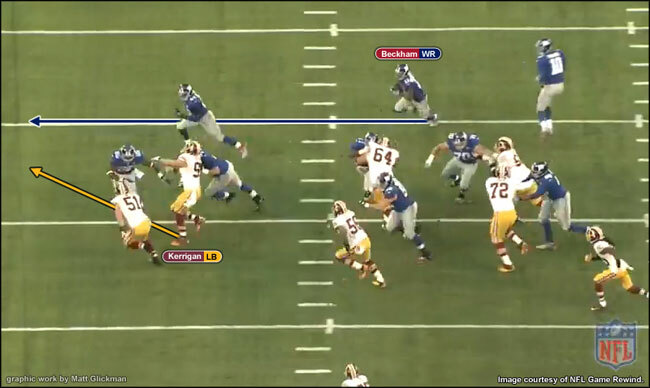 Multidimensional as he is, Kerrigan almost always lines up on the left side of the defense. I wonder if it’s because he’s deaf in his left ear (diagnosed at age eight after several serious ear infections). By aligning on the left, he can hear his teammates, who are on the right. “Nah, that’s not why—it actually should be an advantage that I’m deaf because I shouldn’t jump offside,” he says. 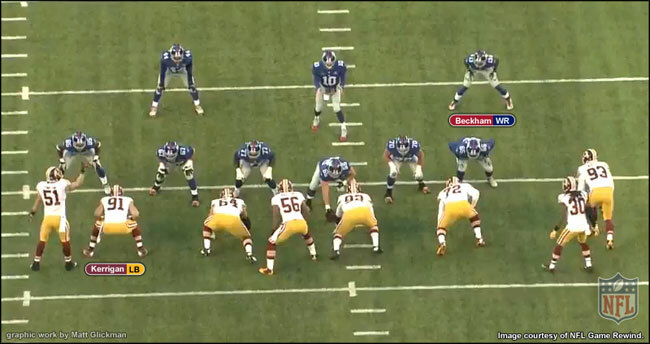 No specific reason is given for why Kerrigan plays on the left. But when we put on the Week 15 film, we’re reminded that rarely is a tendency 100 percent in pro football. 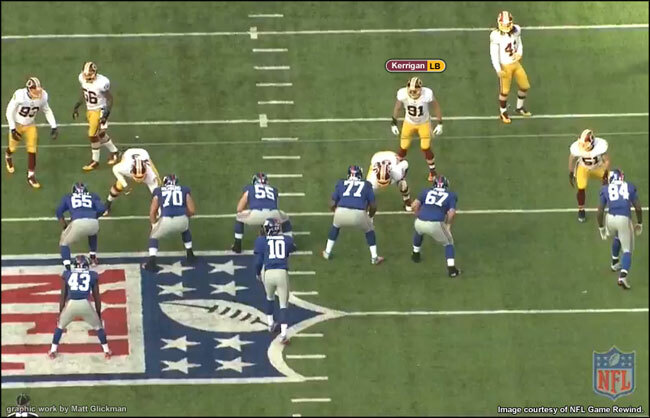 Midway through the second quarter Kerrigan did not line up on the left. 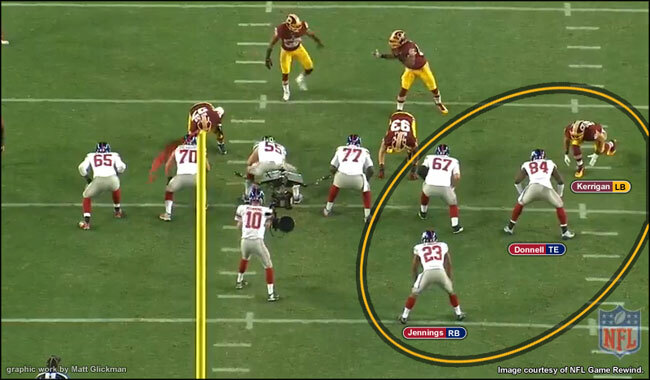 Instead, he drifted into an amoeba look and attacked the right guard as part of an inside blitz. Moving along, we see more battles with Pugh, who continues to pass-block at an angle, rather than dropping straight back. 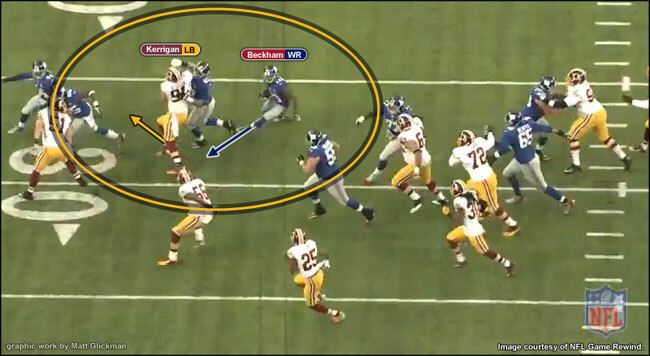 I’m surprised to learn that Kerrigan often doesn’t decide if he’ll go speed or power until after the snap. “Sometimes you predetermine, but ultimately it’s reaction stuff,” he says. Again, there are few absolute truths in football. Not long after Kerrigan says this, we see him diagnose the offensive scheme and sniff out a reverse to Odell Beckham Jr. But not on this play. 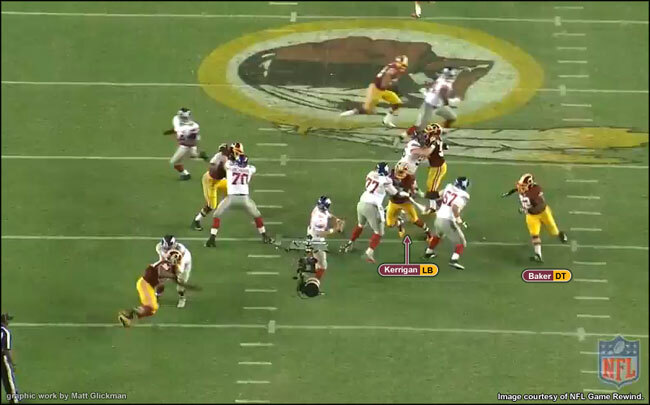 Kerrigan contained the receiver for no gain. Now midway through the fourth quarter of the second game, we start seeing concepts repeated. I tell Kerrigan we can skip through them if he wants. He pays no attention. I try to coax the silver lining out of this, asking if it’s at least a small victory to move a pocket passer like Manning off his spot before throwing. By the time we wrap up, the parking lot is almost empty. With minicamp practice having ended hours ago, the other players are long gone. Kerrigan, limping out of the conference room on a knee he recently had scoped, is handed a boxed lunch—salmon and salad—and makes his way outside. I tell him how much I appreciate his actual analysis, his lack of clichés. You didn’t once say you “just wanted it more” or mention an “it factor” or any of that nonsense, I tell him.